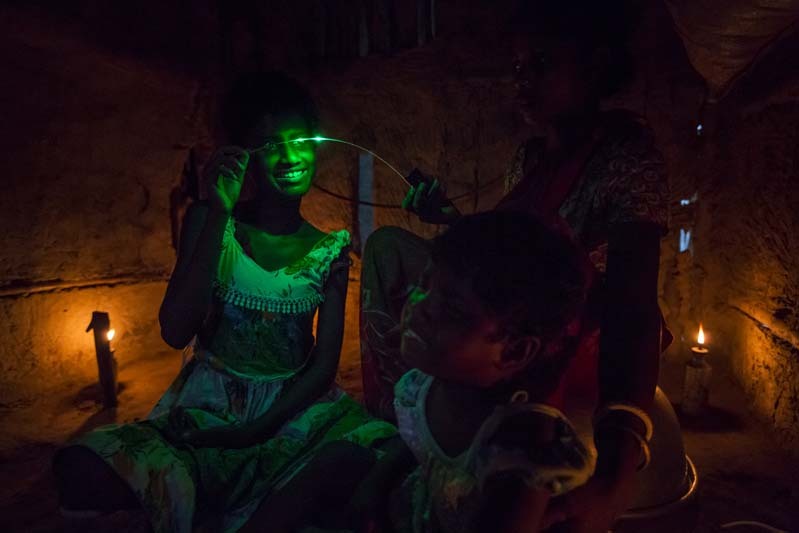 WEST BENGAL, INDIA 26 OCTOBER 2013: Sonia and Anita Singh practise light simulation excercises with their mother in their family hut after eye surgery. Both Anita, 5, and her older sister Sonia, 12, are born into poverty with congenital cataract blindness and they will need to excercise their new eyes for at least six months before their sight approximates normal. The surgery to cure cataract blindness is simple and takes 15 minutes but because of the level of poverty in this family they have been unable to pursue the necessary operation. India has more than 12 million blind, the majority of which suffer from cataract blindness. Poverty is the main reason these millions of people are trapped in this condition. Donor funding has recently enabled both sisters to finally go for this operation. This essay is an attempt to tell the story of their lives before surgery, during the operation to regain their sight and after as they begin to discover light.